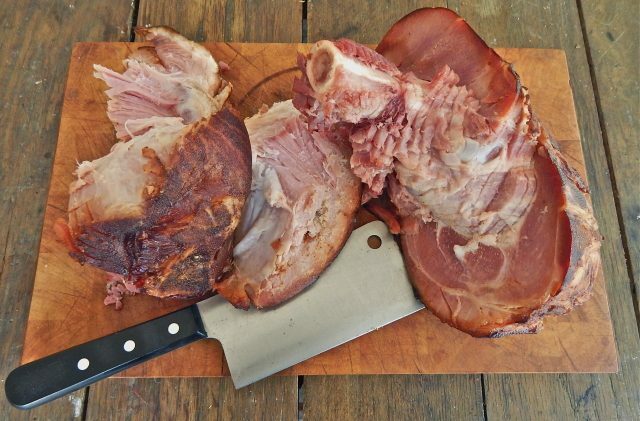 Once upon a time — not so every long ago, actually — families feasted on Sundays and whole hams were a weekly thing. After morning church services, tradition held that folks would gather at Gramma’s house for a proper dinner after the preacher cut the flock loose. In many houses, it was an excuse to loosen the church clothes just a bit and spend the afternoon with extended family and as often as not, the traditional centerpiece was a whole ham sliced and served on the good china. 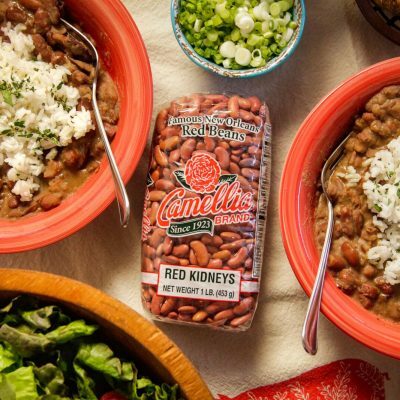 This regional ritual took place all across the southern US, and for food lovers of south Louisiana, it also provided the makings of a different tradition — a pot of red beans slow-cooked with a meaty hambone. 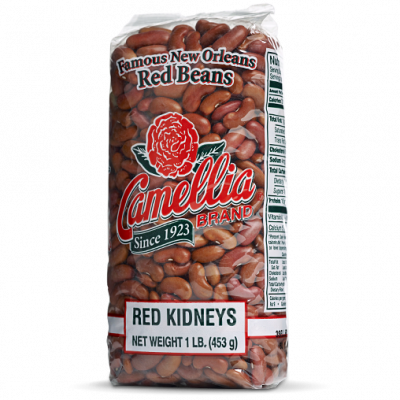 Cooked on a banked fire or a low burner, ham-spiked red beans became a Monday staple in New Orleans home kitchens and restaurant dining rooms. Fast forward to modern times, and things have changed. Americans have shifted from family gatherings to late brunches and toaster pastries. Big Sunday suppers are a lot less common, ham comes pre-sliced from the deli counter and there’s nary a proper hambone to be found. 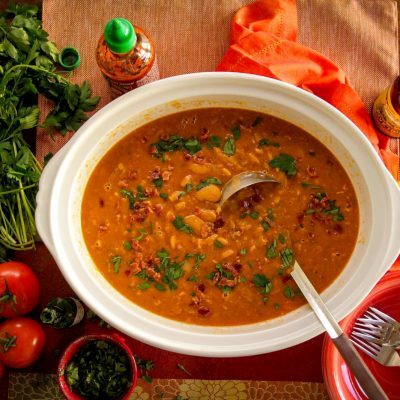 But rest easy friends: you can recapture the traditional magic of gramma’s pork-rich red beans if you know a couple of simple tricks. But first: a little kitchen context. In much of the South, the whole ham represented the very essence of special occasion foods. Whether for a homecoming feast or Easter celebration, it was an at-table event that represents plenty and fellowship. But the Monday magic of the Sunday ham is at the core of the matter. Specifically the BONE at the core of said magically-cured menu item. From a cook’s standpoint, the “leftovers” from Sunday’s feast contain culinary riches that many modern folks would discard. In addition to the little flecks of meat left behind, the hambone (the sizable shank bone from a hog’s hind leg) is filled with flavor from unexpected sources. The marrow hidden inside the shank adds amazing richness to soups and stews. Layers of tough connective tissue can dull a carving knife, but melt into silky collagen when slow-simmered for a few hours. And of course, residual fat in the crevices adds its own distinctive flavor. 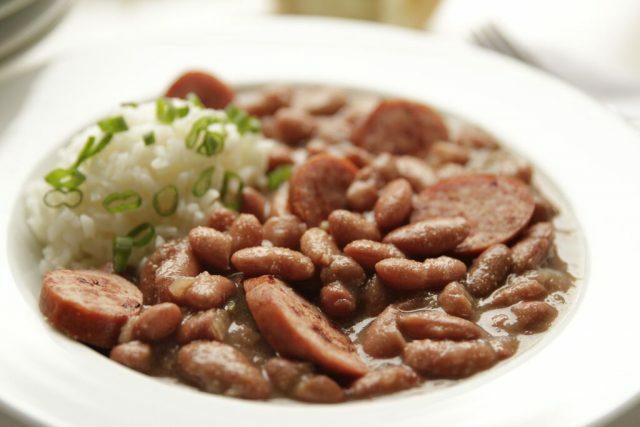 And not surprisingly, these qualities are EXACTLY what you want in a pot of Monday red beans and rice. The key to unlocking these culinary riches, not surprisingly, is time and patience — not exactly hallmarks of Our Modern Times. Luckily, there’s are modern-day workarounds at your disposal for this act of delicious recycling. While we might not go to Gramma’s house every week, we do live in a world where the pre-packaged “spiral-sliced boneless ham” is readily available. In fact, this kind of party-ready cut is SO popular that there are whole strip mall shops dedicated to this simple product (Honeybaked Hams and Heavenly Hams for example) and sandwiches made with same. This convenient trend is absolute gold for the canny home cook, because when businesses sell boneless hams, they’ve usually got extra hambones in the freezer, which they usually sell for a few bucks a pound. And as an added bonus, these hambones tend to have plenty of meat on them, as the ham technicians set cutter blades wide so not to dull them on the shank bone. It’s like the meaty core of Gramma’s ham, yours for a pittance. If you’re a crock-pot aficionado, you’re way ahead on this one. 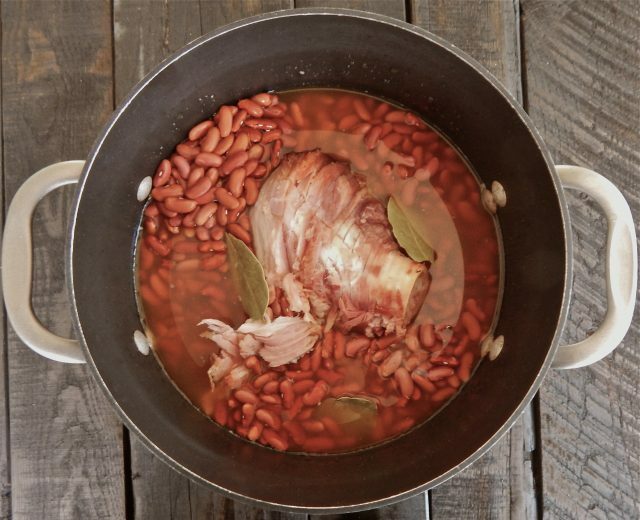 The classic “set it and forget it” move so popular with slow cooker folk will extract all the goodness from a hambone, whether you’re making an simple overnight ham stock or starting a pot of red beans while you wait for your morning coffee to brew. 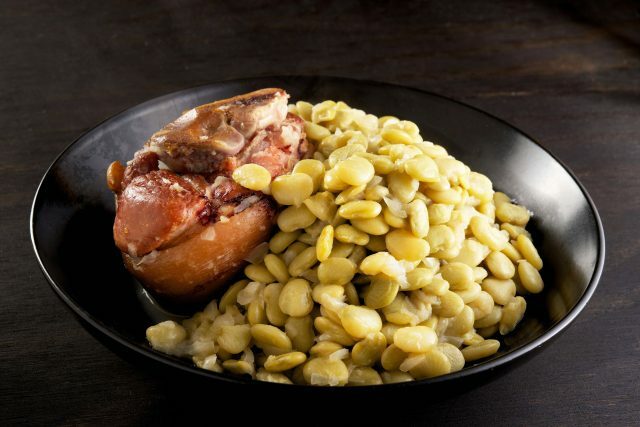 When they’re done, you’ll have all the porky, beany goodness (church clothes optional).